October 2, 2018, Adrian, Mich. – Sister Attracta Kelly, OP, an immigration lawyer, will offer a public presentation on a newly proposed change in the U.S. Citizenship and Immigration Services (USCIS) policy that would make it harder for people to get legal status in the United States. 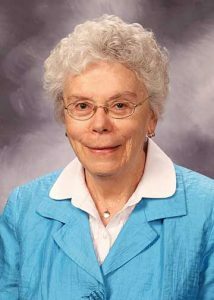 She will speak from 6:30 to 8:00 p.m. Thursday, October 11, 2018, in the Rose Room at the Dominican Life Center, on the Motherhouse Campus of the Adrian Dominican Sisters. All are welcome and encouraged to attend. The proposed rule would redefine the concept of a “public charge,” which can disqualify people obtaining legal status. Public charges are immigrants who are or are considered likely to be financially dependent on benefits from the U.S. government. Currently, “public charge” grounds apply only to immigrants who receive or are considered likely to receive cash assistance benefits, such as social security. The new proposal expands the “public charge” grounds to non-monetary benefits, such as food stamps, housing assistance, or Medicaid benefits. Once the proposal is formally published in the Federal Register, the public will have 60 days to submit their comments for or against the proposal. Learn more about the proposal and its implications for U.S. immigrants and submit comments as soon as possible. Those who cannot attend in person, can watch Sister Attracta’s presentation via live stream on the Adrian Dominican Sisters website, www.adriandominicans.org/LiveStream.aspx.